1. 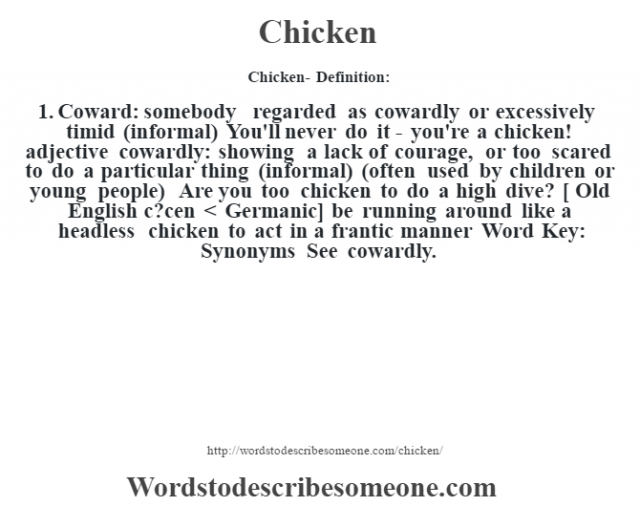 Coward: somebody regarded as cowardly or excessively timid (informal) You’ll never do it – you’re a chicken! adjective cowardly: showing a lack of courage, or too scared to do a particular thing (informal) (often used by children or young people) Are you too chicken to do a high dive? [ Old English c?cen < Germanic] be running around like a headless chicken to act in a frantic manner Word Key: Synonyms See cowardly.